Guzu allows consumers and businesses to sell their working and non-working electronics for cash, discouraging dumping abandoned electronics in landfills and adding to the millions of pounds of e-waste produced every year. This Earth Day, Guzu Inc. will be celebrating its one-year anniversary. Launched by a trio of eco-preneurs, Guzu has grown from a local New York recycling pick-up service to a nationwide electronics recycling company. Their programs encourage consumers to recycle their electronics properly by offering innovating value propositions. There are presently over 3 billion consumer electronics in homes all across America and over 500 million consumer electronics sold annually. Many of these electronics are thrown away or stashed in junk drawers, with only a very small portion being sold on resale sites like eBay and Craigslist. Meshkat recognized the need for an incentive based national electronics recycling program that requires little work on the part of the consumer. In its first month, Guzu recycled 3,400 pounds of e-waste and since then has been recycling an average of 3,500 extra pounds per month. To date, the young start-up has recycled 200,000 pounds of e-waste and has helped businesses and schools across the country – from New York City to Sleepy Eye, Minnesota – reduce their carbon footprint. The business model does not end there. 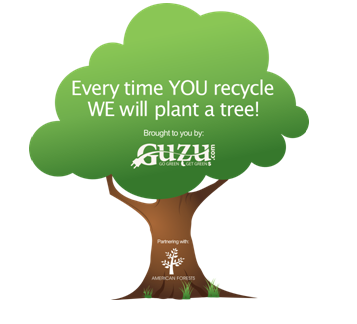 With every unit recycled, Guzu plants a tree on behalf of the consumer through American Forrest, a nonprofit organization that seeks to protect the natural capital of trees and forests. Unlike resale websites, Guzu guarantees that every electronic unit obtained is recycled to the highest extent; the silicon on the boards, LCD’s, plastics, metals, and even the cardboard boxes customers use to mail their electronics to the company, are properly recycled, found a new home or use for, or sold for parts used to revive secondhand products for further use. Guzu also hosts electronic recycling drives in cities across the country where residents are encouraged to donate their outdated electronics at participating locations. In addition, Guzu’s Business & Volume Recycling division offers a turnkey, free recycling solution for small-to-medium-sized companies looking torecycle their old IT equipment and reduce their e-waste. How To Recycle With Guzu: Consumers can recycle their gadgets on Guzu.com in three simple steps. First, users can search for their electronic item on the homepage and receive an immediate price quote from the company. Once their transaction is completed through the site, Guzu will email a FREE shipping label for the consumer to use in mailing their electronics to the company. Once the shipment is received and processed by Guzu, payment is sent via PayPal or business check, as designated by the consumer, and a tree is planted on their behalf.